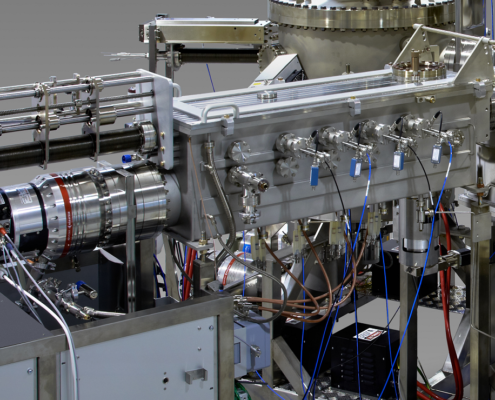 The L4 is a UHV magnetron sputtering system with up to four rectangular magnetrons. The substrate is moved over the magnetrons in a sequantial deposition mode. Each magnetron is provided with an electro-pneumatic shutter which allows computer controlled deposition of multi-layers. The maximum substrate size is 6″. The film thickness is controlled by the scanning speed of the substrate and the magnetron power. The L4 is compatible with all DCA substrate transfer systems including the CDC cluster tool system.